A question: do you really have an interest in novels? I ask because, when happening upon websites for budding writers recommending craft laxatives to ease the passage of a trapped bestseller, you realise a cold, alien world. In the presence of expertise, you assure yourself that you have no interest in plot, no interest in protagonists, no interest in major themes, no interest in dialogue, in clothing, in colours or in descriptions of any kind. You have no interest in the chronology of events, no interest in a cast of characters, no interest in anyone's tone of voice, in linguistic verve or in graphic accounts of a controversial nature, and you say you wish only ever to avoid dramatic situations. What's more, you have no interest in shifts of tone, in register, in settings, in scenes, in twists, in revelations or insights into the human condition, and the prospect of a well-written, page-turning, award-winning novel, one which tackles an important social issue, stimulates in you only grief. Yet still you read novels. Why? The appearance of these texts in English [described by Derrida as ‘some of the finest political tracts ever written’] is immensely valuable, and will enable readers not so much to see what Blanchot’s work would have looked like had it been completed, but to grasp that the notion of completion is only part of the fragmentary writing he was beginning to explore in this period. This can be seen in his own discussion of the posthumous editing of Nietzsche, when he asks: ‘What are we looking for in these fragile texts? Something that cannot be found in any text, the hors-texte, the word that is de trop, in order that it should not miss its appointment with the completion of Complete Works, or on the contrary, in order that it should be forever missing?’. John McKeane reviews Maurice Blanchot's Political Writings: 1953-1993. When I open the garden door, I enlarge the garden so far as Mount Caburn. There I walk in the sunset, when the village climbing the hill has a solemn sheltering look . . . emblematic. Virginia Woolf in her diary, 1920. I took the photograph above at the end of March 2011 as I cycled toward Southease in the East Sussex countryside (almost identical, it turns out, to Google Street View's from the same road). It marks the end of the first half of a regular journey. Less than a mile further on is Monk's House, Virginia Woolf's final home and where she wrote Mrs. Dalloway. I notice now that a week later was the seventieth anniversary of the author's suicide. 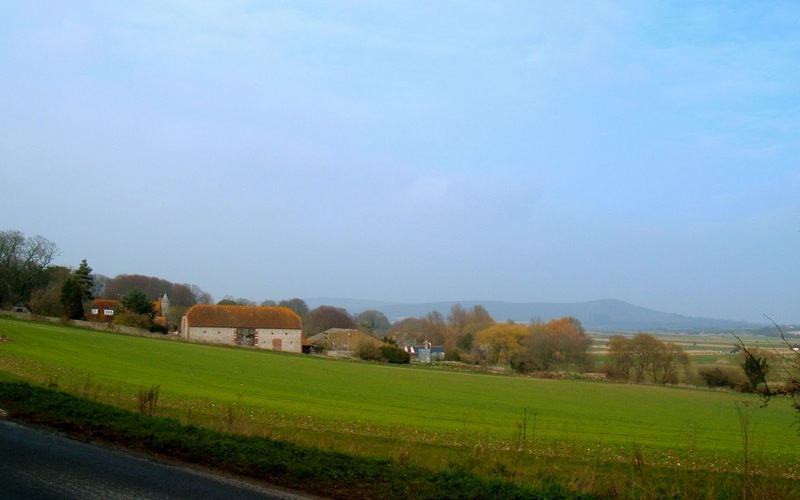 She would have walked out of the cottage into the meadows to the right of this picture, meadows surrounding the River Ouse flowing left to right towards the port of Newhaven. In the background is Mount Caburn. He fears "the long read is a dying art ... Very literate people admit they can't read books any more." Martin Amis interviewed in The Observer, April 2011. If I write all this in defence of Flaubert, whom I do not much like, if I feel myself so deprived at not writing about many others whom I prefer, it is because I have the impression that we no longer know how to read. Marcel Proust writing in the Nouvelle Revue Française, January 1920. While you're not here, please do check out my new Tumblr blog of Resonance. It was begun last week as a repository for quotations that demand release while leaving this space uncluttered but for reviews and other, longer posts. The title, by the way, completes what may have been this blog's fuller title taken from a passage in "What is the Purpose of Criticism? ", Blanchot's preface to his book Lautréamont and Sade which, six and a half years ago, seemed ideal for my first solo blog. As a blog goes on, unable to rest in the spurious unity of a book and always in danger of collapsing for want of a conclusion, I want to look forward with the help of perhaps the one quotation on the new blog of which I feel a commentary is demanded yet in its absence may well establish This Space's renewed purpose in this nether time: to distinguish between fiction of rhetorical interest or power and novels which, as we read, "enact a desperate movement in the inner reaches of one's being".